Multi-stage parts There are no products in this category. Our Application Engineering team at CELO work in close collaboration with our customers to develop application-oriented solutions adapted to its individual requirements. Based on the specific application demands and its functionality, the component may require complicated geometry and tight tolerances. Multi-stage cold forming manufacturing process provide the possibility to manufacture large head-to shank ratio parts reaching the highest quality demands from our customers. Its functionality offers many opportunities for cost savings in comparison with classical turned part manufacturing. When it's requested to add drill holes, ball shape, clearance grooves or undercuts, parts can pass to be CNC machining process. 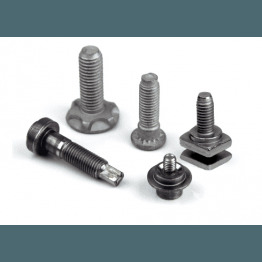 • Special Large head-to-shank ratio screws. We produce ball studs under special demand to fit your exact requirements.